State-owned oil/gas company Saudi Aramco is to acquire a 17% stake in South Korea’s Hyundai Oilbank for about US$1.25 billion. 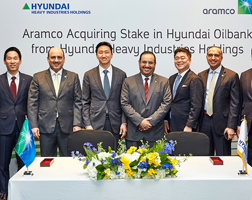 Saudi Aramco and Hyundai Heavy Industries Holdings say that they have reached an agreement for Aramco Overseas Company (AOC) to purchase the stake. AOC’s investment in South Korea’s Hyundai Oilbank will support Saudi Aramco’s crude oil placement strategy by providing a dedicated outlet for Arabian crude oil to South Korea, the companies said. Hyundai Oilbank is a private oil refining company established in 1964. The Daesan Complex, where Hyundai Oilbank’s major facilities are located, is a refining plant with a processing capacity of 650,000 barrels per day.